What do you do when you feel that you are deeply a part of something, and yet feel so separate that you might never connect with anything again? Do you feel the inherent contradictions in these statements, and do you feel them in yourself? 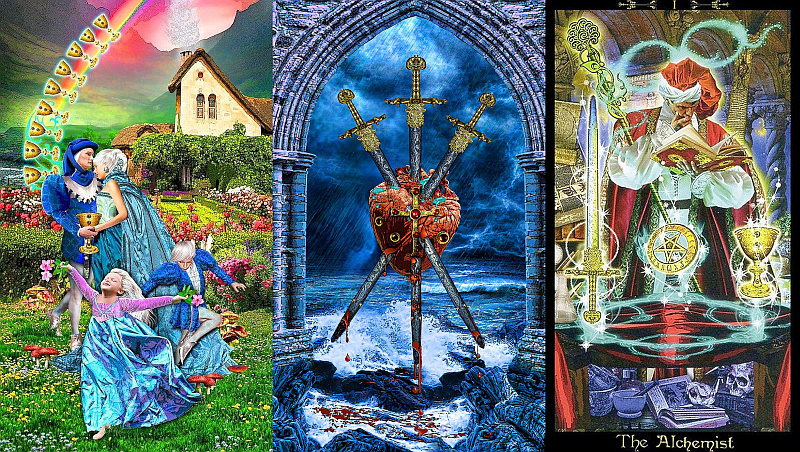 Then you are in the land of Alchemy holding both the Ten of Cups and the Three of Swords with equal regard. The tension of opposites, when worked with well, depends on no resolution. When you work with both forces, you are “both/and” and not “either/or”. Where have you been “either/or” with these two cards, the Ten and the Three? And how do you feel about what it means to be “both/and”? If you feel you can’t, then look at the third card, and know that it is here for a reason – in front of you for a reason. And you are here for a reason. And part of the reason, according to this reading, is to rise to the challenge of this particular act of magic. Masculine and feminine. Fulfilment and lack. Togetherness and separation. Heart, and mind. Where in your life have you felt that one is welcomed, and the other needs to step away? Where can you invite them both in to sit at your table – as autonomous experiences, the two very different children that they are – and make them feel like they are both at home in you? And what is created from that force? What do you make space for when you make space for what defies being squared away? What freedom do you discover when your options broaden into possibilities you hadn’t yet considered?